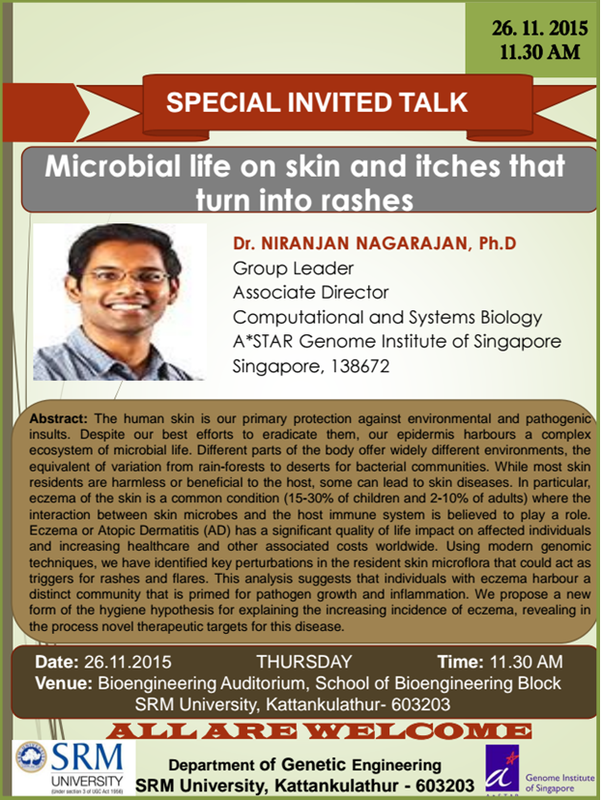 Special Invited Talk on "Microbial life on skin and itches that turn into rashes"
The human skin is our primary protection against environmental and pathogenic insults. Despite our best efforts to eradicate them, our epidermis harbours a complex ecosystem of microbial life. Different parts of the body offer widely different environments, the equivalent of variation from rain-forests to deserts for bacterial communities. While most skin residents are harmless or beneficial to the host, some can lead to skin diseases. In particular, eczema of the skin is a common condition (15-30% of children and 2-10% of adults) where the interaction between skin microbes and the host immune system is believed to play a role. Eczema or Atopic Dermatitis (AD) has a significant quality of life impact on affected individuals and increasing healthcare and other associated costs worldwide. Using modern genomic techniques, we have identified key perturbations in the resident skin microflora that could act as triggers for rashes and flares. This analysis suggests that individuals with eczema harbour a distinct community that is primed for pathogen growth and inflammation. We propose a new form of the hygiene hypothesis for explaining the increasing incidence of eczema, revealing in the process novel therapeutic targets for this disease.